1 of 3 In a small bowl, combine curry powder, salt, sugar, ground cumin and black pepper. Rub onto chicken. Heat grill to medium-high heat. 2 of 3 Meanwhile, bring a medium saucepan of lightly salted water to a boil. Add couscous and cook for 9 minutes. Drain and rinse with cool water. 3 of 3 Grill chicken for 5 to 6 minutes per side, depending on thickness. Remove to a cutting board and cut into 1/2-inch pieces. 1 of 2 In a small bowl, whisk together lemon juice, honey, salt, curry powder and pepper. While whisking, add oil in a thin stream. 2 of 2 Place couscous in a large bowl. 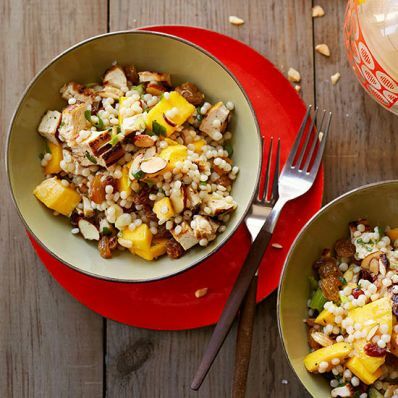 Add mango, raisins, scallions, almonds and cubed chicken. Drizzle with dressing and toss to coat. Refrigerate unless serving immediately. Per Serving: 516 mg sodium, 5 g fiber, 33 g pro., 2 g sat. fat, 56 g carb., 15 g Fat, total, 66 mg chol., 482 kcal cal.